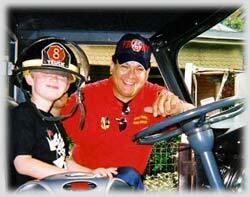 Moonstruck Firetrucks: Rent a fire truck for special occasions like kids parties, parades and weddings. The 1975 American La France fire truck has been modified to safely accommodate 16 passengers of all ages on upholstered seats with seatbelts; 12 passengers in the back open area, 2 adults in the jump seat open area and 2 passengers in the enclosed cab area with the Fire Fighter/Driver. A 3 car length space is needed in front of your party location to accommodate the 28 foot long fire truck. We are fully insured. 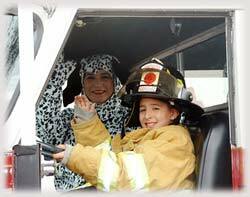 The fire truck arrives at your party location accompanied by a Dalmatian costume character named "Spotty." The Child's name will be announced over the PA system upon arrival. Your Child will be presented with a red goody bag which contains a red plastic fire chief helmet and a Moonstruck Fire Truck T-shirt. In addition to safety stickers and Junior Fire Fighter badge stickers to pass out to party guest. We will conduct a short interactive safety presentation with the children. The children will then be allowed to wear the authentic fire fighter gear, climb aboard the fire truck and take photos or just explore. Spotty will ride in the back open are to entertain the passengers and promote safety. We are able to do 2 runs during the allocated time. We will then close by posing for photos with your birthday cake. The event takes approximately 1 hour and 15-30 minutes. The fire truck arrives at your wedding reception location with lights flashing and sounds the alarm to collect the bride and groom for their farewell celebration ride. Your wedding party may climb aboard for group photos. Marketing: Looking for a unique way to promote your next big event? Everyone is drawn to a Big Red Shiny Antique Fire Truck. Moonstruck positions the antique fire truck at your business location to increase your exposure. Promotional events may include TV news coverage, photo advertisement, you tube videos, grand opening, fund raising, sales, kid's night, static display and fire prevention month. The fire truck is the staging area for everybody's favorite hits music with two large speakers and a microphone for your special promotion sales/prize announcements. The antique fire truck is decorated in patriotic theme. Post your signs, banners and other marketing to maximize your advertisement opportunities. Guest are invited to wear the authentic firefighter gear, climb aboard, explore and take pictures. Each guest will be given a Moonstruck Junior Firefighter badge sticker. Charity Events: Tickets are sold per passenger to climb aboard and take group rides. Special Occasion Gift Certificates may be raffled or auctioned for a fire truck event. Position the fire truck at the gate with your large WELCOME banner and sell tickets to wear the authentic firefighter gear, climb aboard explore and take pictures. Have the fire truck as the back drop at the staging area for the golf tournament or 5k walk/run. Family Group Photo: If your family bored with the traditional matching sweater picture around the fire place? Are you searching for a unique family group photo that everyone will be talking about? Surprise your family when the big red shiny antique fire truck arrives for the back drop photo shoot. Imagine the excitement and REAL BIG SMILES that will be captured by your photographer. Climb aboard and take the family for a ride, it will be an event they will always remember. Booster Club Members rent the fire truck for the big homecoming game or pep rally. Have the Cheerleaders or homecoming court and school mascot arrive to the pep rally or game with lights flashing and sounding the alarm! Imagine the excitement and surprise as the students cheer and screams get louder! Capture those pictures for the year book. Moonstruck will assist in customizing a program to meet your needs. Q: Do Fire Fighters receive a discount? A: Yes, they will receive a 5% discount per rental, this cannot be combined with any other offer. A badge number will be required for verification. Q: Are combined birthday parties allowed? A: Yes, they are and there is an additional $10.00 charge. A: Yes, we do so please contact us for a quote. Q: Is a deposit required to reserve the date? Q: Do you have a bad weather policy? A: Yes, if your event must be canceled due to bad weather, you must notify Moonstruck Fire Trucks two (2) hours before the scheduled event time. Call 210-365-4229 or the Moonstruck contact name provided to you. If you cancel because of bad weather, all rental fees will be transferred so you can move your same event to another date and time. A: Yes, if you want to completely cancel (not for bad weather) you must request it in writing five (5) days before the date of your event. You will receive a full refund except for $110.00, which Moonstruck keeps as liquidation damages to repay expenses incurred in scheduling your event. For a complete cancellation, you may transfer all rental fees to another event.